Pune, Oct 25 (IANS) The second One-Day International (ODI) between India and New Zealand here became embroiled in controversy hours before its start with allegations of corruption against curator Pandurang Salgaoncar. A television channel claims to have conducted a sting operation in which reporters posing as bookies approached the curator asking for a pitch which will favour the fast bowlers of one of the competing teams. The curator is seen and heard on camera agreeing to the demands. “It will be done,” Salgaoncar is quoted as saying by India Today. “It is a very good pitch on which 337 runs will be chaseable. There is no doubt about it,” he added. Salgaoncar and others are also seen walking on the pitch. “It’s not allowed still we did it. The BCCI observer is also sitting around,” Salgaoncar said. “No stranger can access the pitch. That is the BCCI and ICC’s law. If someone asks me tomorrow I will say no one came, I don’t know,” he added. The Board of Control for Cricket in India (BCCI) and the Maharashtra Cricket Association (MCA) have decided to terminate Salgaoncar’s contract. “After reports stating an alleged malpractice from the MCA pitch curator Pandurang Salgaonkar, the MCA has dismissed Salgaonkar from the position of curator with immediate effect,” the BCCI said in a statement. 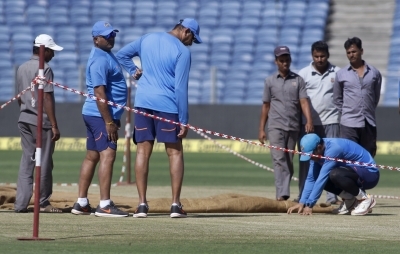 “The BCCI appointed curator Ramesh Mhamunkar was immediately made the point person for the centre wicket and the field of play for the 2nd ODI between India and New Zealand. “The International Cricket Council (ICC) Match Referee Chris Broad inspected the pitch ahead of the match and cleared the same for the game to go ahead,” the statement added. BCCI Acting Secretary Amitabh Choudhary asserted that the issue has been dealt with effectively. “The BCCI has zero tolerance towards any activity that brings the game to disrepute. We have acted swiftly and ensured that there are no loopholes left ahead of the second ODI between India and New Zealand,” he added. “It a very serious matter. There is zero tolerance for such things. This is more shocking as Pandurang Salgaoncar himself was a first class cricketer,” he added. BCCI CEO Rahul Johri too echoed the same opinion. “Strict action has been taken against the pitch curator and the employment relationship between Pandurang Salgaonkar and MCA stands terminated. The BCCI is in touch with the MCA and appropriate measures will be taken with regard to the matter,” he said. The Supreme Court appointed Committee of Administrators (CoA) has also taken a dim view of the matter. “We are looking into the issue and are in contact with the concerned officials. We have asked for a detailed report and will act upon it accordingly. At BCCI, we have zero tolerance towards any such activity,” CoA chairman Vinod Rai said. Salgaoncar represented Maharashtra as a fast bowler from 1971-82. He has also served as chief selector of the Maharashtra Ranji Trophy team.